WHAT IF WE WELCOMED JESUS TO CALM OUR FEARS? If we invite Jesus to come fully into our families and congregations, what would He do? What might His deliverance look like? If we welcomed Jesus fully, His presence would expose our fears. When Jesus set foot on the shore, the demons of fear were exposed, while the afflicted man ran toward Jesus in worship (Mark 5:6). We may be ignorant of deep fears which lie behind our attitudes of prejudice. We must spend time in prayerful invitation for the Holy Spirit to reveal to us these deep fears and anxieties which have become embedded in our hearts. We may experience internal resistance from those very fears as they are exposed, and fearful friends around us will surely entrench against such exposure. If we welcomed Jesus fully, we would identify fear-mongers around us. Society has become so filled with fearful voices that some have become deadened to scenes of violence. “Evening News” should more accurately be called “Evening Fears.” Christians should no longer allow purveyors in fear to speak into our living rooms or mobile devices. In fact, where possible, we should expose and rebuke their actions. If we welcomed Jesus fully, He would replace our spirit of fear. Scripture says, “For God has not given us a spirit of fear, but of power and of love and of a sound mind” (2 Timothy 1:7). If we will invite Jesus to stay with us, we will be launched in a new direction which will last all our lives. We will increasingly receive God’s power to think, speak, and act against fear. The resurrection power of Christ will give courage to stand against the tide and willingly suffer for kingdom righteousness. We will experience victory over fear, for “He who is in you is greater than he who is in the world” (1 Jn. 4:4b). We will increasingly receive God’s love for others. 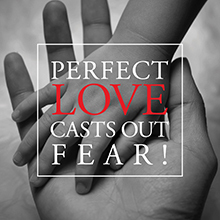 Scripture says that perfect love casts out fear (1 Jn. 4:18). With love, the desire to defend the vulnerable will replace our need to protect ourselves. With love, the willingness to take risks for what is right will replace our need for control and safety. And as we welcome Jesus to stay, we will increasingly receive a sound mind. The naturalistic culture around us constantly bombards us with multitudinous fears. But scripture tells us to not be conformed to this world, but transformed by the renewing of our minds (Rom. 12:1,2). We do that by intentionally seeking and embracing the mind of Christ (Phil. 2:5). Be warned, the mind of the world hates the mind of Christ. This single fact should be a warning to those of us who seek consensus with the broad way. But it should embolden us to pursue the narrow way which leads to life.